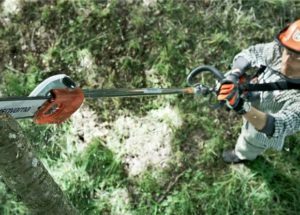 Pole saws can be lifesavers when it comes to fixing unruly trees and plants on your property. And when it comes to sheer power, you can’t really find an option more adept than one powered by gas. Read on to hear about the best models on the market today. There a number of factors that you should take into account when purchasing a top pick from our list. This is a tool you are going to be holding for extended periods of time to chop through hefty branches on tall trees. The last thing you want is a model that will tire you out so quickly you are not able to hold it for long enough to get the job done. Really nice models do not produce an unbearable amount of noise. Of course, it is always best to wear protective ear gear when handling any piece of heavy duty equipment, but with a cheaper price tag, you might have to take it a step farther than with a nicer brand. A gas pole saw can be a significant purchase, and no tool is guaranteed to be functioning forever – so you will want to look into the manufacturer and see if they are known as a company that responds well to customer needs and easily provides replacement parts. The TrimmerPlus TPP720 is a great pole saw that is reliable and will always get the job done for you, no matter what job you need completing. 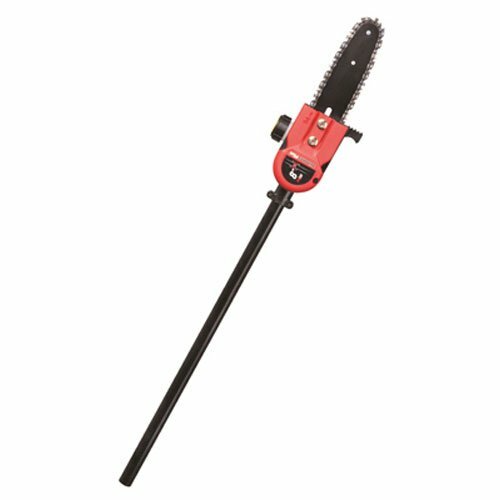 This saw should probably be your top choice if you are interested in getting one for yard maintenance because it is noticeably quieter than many of the other saws available on the market today. This saw is also particularly on the safe side, even for those people with little to no pole or chain saw experience. The chain stops running immediately, so it would be really difficult for a user to cut themselves. This saw is made of high quality material that will last years and years, but this durability does not cause the saw to be heavy or unwieldy. On the opposite end, this saw is one of the most lightweight you can find. The TrimmerPlus TPP720 is a great option that anyone, even those with almost no saw experience, can access and use with ease and safety. There are parts of this saw that are made of plastic as opposed to steel, but it is high quality plastic and this design helps contribute to the lightweight quality of the saw. The Remington RM25PS Maverick is an awesome pole saw for homeowners who are looking to do some casual tree cutting. Although, you should not think that this saw can’t hold its own – it definitely can, with users report the ability to use this saw to cut through tree limbs up to three inches in thickness! The key to using this saw properly is to allow the saw to pull itself through the cuts it is making. It is lightweight, yet it is still hefty enough to cut through the branches using its own weight. This makes the saw remarkably easy to use, and when you combine the ease of use with the ease of adjustment and the ease of assembly (the initial setup for this saw should take no more than twenty minutes), you can see why it remains popular. The Remington RM25pS Maverick is a great choice to maintain the trees on your property. It will be able to cut through any branch you put in front of it, provided you use the saw’s weight to pull it through the cut. It does vibrate a lot, but that is a small price to pay for a saw of this level of efficiency. The Maxtra Gas Pole Saw is a fantastic model with a good range of versatility. Users report that this saw cuts through a wide range of wood, including white oak, pine oak, chestnut oak, locust, pine, and wild cherry. Some of these trees had limbs up to eight inches in diameter and the Maxra just buzzed right through them. Its versatility means it can be used for a variety of projects, not just trimming trees (users report it is particularly good at clearing fences as well). 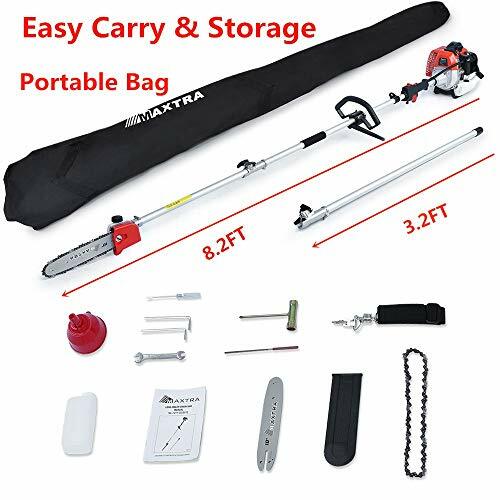 It is easy to use, and can be adjusted to be easily carried by pretty much anyone, as the weight distribution can be modulated by sliding the handle. 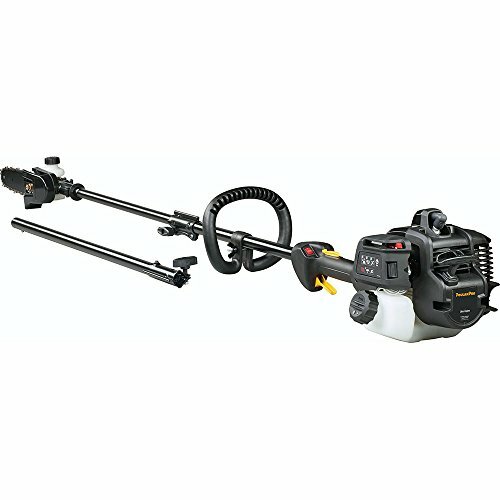 It has an excellent ratio of power to torque that will make all of your cutting jobs incredibly simple and efficient. Best of all, it is made of high quality material that is guaranteed to last for years and years, so you are making a solid investment when you put money into a Maxra. The Maxtra Gas Pole Saw is an excellent option with a wide range of cutting ability that will lend you versatility in the number of projects you feel comfortable tackling. The user manual is definitely not the most helpful, though, so get ready to read some reviews and watch some videos to figure out how to work this amazing saw. 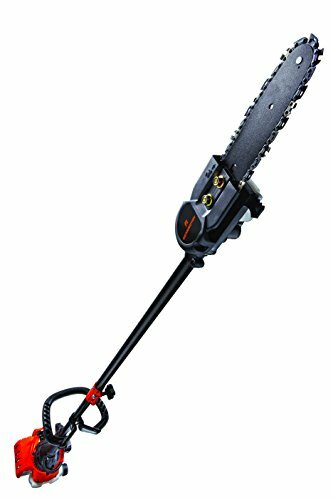 The Poulan Pro PR28PS is a great model with a leg up on the competition: it is not just designed for sawing limbs off of trees, but also for trimming shrubs and other low lying yard plants. It is able to accomplish this because when you order this saw, you get two attachments with it: a chainsaw attachment, and an edge trimmer attachment. Twice the bang for your (limited) buck! You may be thinking that a saw with multiple attachment types is going to require a lot of time and energy to swap the attachments out, but you would be wrong: it is quick and simple to change out this saw’s attachments, and believe it or not, attachment changing actually does not require any tools. Pretty wild! This saw is powerful no matter what you are using it for, and you have a wide range of options for what you can use it for, considering the included extension can reach up to twelve feet in the air. If you are looking for a multi use product that can get any job done, look no farther than the Poulan Pro PR28PS. The Poulan Pro PR28PS is an incredible choice with multiple included attachments for added versatility. Just make sure you have a lot of gas on hand before you start cutting. The TrimmerPlus PS720 8-Inch is a fantastic choice for homeowners. Like its cousin, the TrimmerPlus TPP720, it is a lot less loud than some of the other models featured here. You can always count on the TrimmerPlus brand for a good amount of reliability and durability through high quality material use that does not compromise the overall weight of the saw or make it too heavy to wield effectively. The quality means that the TrimmerPlus PS720 is a saw that would be easy for anyone to use, even those with minimal to no experience (or even saw experience in general). But because of its great design and hefty blade, it can still shred through whatever branches you need removed. The TrimmerPlus PS720 is one that anyone can use effectively. Just know you may need to spend some time clearing out the saw housing from accumulated wood chips. Just like with a car, you do not want to constantly be refilling your gas tank to make sure your pole saw does not sputter out mid cut. Make sure you are investing in a product that produces a lot of cutting bang for your gasoline buck (this quality will ensure your saw is more environmentally friendly, too!). The best models have a wide range of capabilities and can chew through a ton of different types of wood. Some even come with multiple attachments, like the Poulan Pro PR28PS listed above, that will allow for many different kinds of cuts and trimming. The best will not break down easily or require you to spend hundreds of hours (and dollars) to purchase and install replacement parts, or to tighten and adjust parts that should be working well but are not. Make sure you find a saw that is durable and will last you a long time. The last thing you want is to spend a lot of time looking into different choice, finally decide on one, wait patiently for it to arrive, unpack it, assemble it, put fuel in it, get it up and running, take it out to that tree whose branches have been bugging you for months and realize…the saw can’t actually reach the top branches. Make sure you get a saw that is long enough to get all your jobs done! Hopefully, you are not going to be needing one that often. This means you will likely go a long time between uses, and it can be easy to forget the best way to hold and manipulate on in the moment. You will want a saw that is intuitive and easy to use so that you can pick it up after months and hop right back in with no problems. These require a pull to start their engines, and it can be a somewhat laborious process. The last thing you want is a saw that is going to require multiple pulls or go through fits and bursts when it first starts up. Gas pole saws can be a game changer for yard work. Make sure you invest in the right choice for your trimming needs, keeping in mind the factors we have discussed above, and you will certainly not be disappointed with your purchase.